There’s actually a trick to opening a bucket lid. Pull out on the lip rather than up. 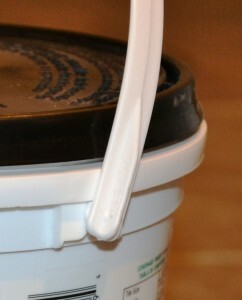 But some lids are so stubborn that even this secret pro bucket-wrangler technique isn’t enough. Prior to using a bucket wrench, I used to get such bad bucket fingers that for a while I’d lose the feeling in my finger tips! Your knuckles and fingertips will be spared this suffering with this simple bit of molded plastic. 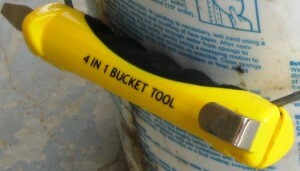 Bucket wrenches run a measly 4$ on Amazon, which is actually less than the cost of a single Gamma Seal Lid. And if you’re a serious bucket opener, check out this bung nut wrench from USA Emergency Supply. 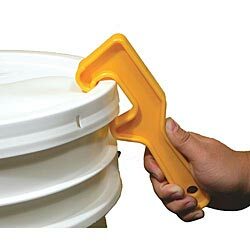 This thing has ten times the durability and opens several varieties of buckets and drums. For wrenching buckets open and smacking them closed all in one tool that attaches to the handle, look into the bucket multitool featured in the Multitool article. I’m really interested to know how to bodge a bucket wrench. Will a standard prybar work? What about a scrap piece of rebar? A metal spatula? I’ve not found a great way to DIY a bucket wrench but the technique has got to be out there. If you’ve found a way to engineer a homemade bucket wrench I’d love your input in the comments. Would a “C” clamp work? Or perhaps an adjustable wrench? Yeah good point, a c clamp could work. A C clamp is adjustable and seems to be about the right size and shape. I’ll have to try that next time I’m around one!